As a young girl growing up in Santiago, Chile, in the early 1900s, she read an autobiography of a French-born saint—Thérèse, popularly known as the Little Flower. The experience deepened her desire to serve God and clarified the path she would follow. 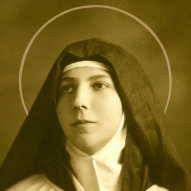 At age 19 she became a Carmelite nun, taking the name of Teresa. Teresa remains popular with the estimated 100,000 pilgrims who visit her shrine in Los Andes each year. She is Chile’s first saint.